I have a nice little Portable Media Player, YP-Q2 from Samsung. The main reason for choosing this was its built in support for Ogg Vorbis audio format. It has video support as well but with its own format – svi. It is basically avi container with mpeg4 video and mp3 audio (it supports wmv as well). I found out the right combination of ffmpeg options by comparing a sample file created by EmoDio software that came with the device. echo "Usage: ffmpeg2svi <input> <output.svi>"
ffmpeg -i "$1" -vcodec mpeg4 -acodec libmp3lame -f avi -s qvga -aspect 4:3 -sameq "$2"
Hopefully this works with other models from Samsung as well. It was one of those special weekends when you feel so happy even though it was fully packed and you are fully exhausted. Especially the travel across the city and back in the evening after full day of non stop talking was very tiresome. But it was very well spent indeed, especially when you have worked with so many awesome people who just camp up to you and asked how can I help or just volunteered without even asking or made sure everything is in place. It was a fantastic team effort and every one deserves the credit. The enthusiasm and excitement of students was very encouraging. From what they have told us it seems they enjoyed the camp as well. Gautam said he found the informal and interactive nature of the delivery very useful. Some of them wanted to go deep into speech recognition. 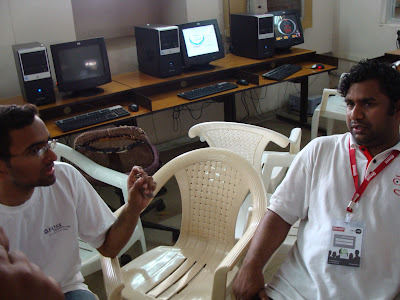 Every Localisation Camp targets at least one new translator in addition to spreading awareness about making computers available in a language that is used in every other communications. This time the main target was Labeeb 🙂 When we met for the first time during gnunify he mentioned he wanted to help out with translations but did not know where to start. So I thought I will call him to Red Hat’s office one weekend and will sit down with him and show him how to translate applications. Moreover he is already a contributor to Malayalam Wikipedia. I already had my audience requirement fulfilled so I announced the event as a continuation of the translation camps smc started already. I talked to more people and every one was receptive to the idea and offered their help. So at no point in time I had any tension about the success of the event. We had a meeting of Uncode, Lokayat’s Free Software initiative and we decided to have it organised jointly. Abhijit helped mobilise students from College of Engineering, Pune and their FSUG joined in as well. The idea of a small event was shared by so many and the event grew in no time. 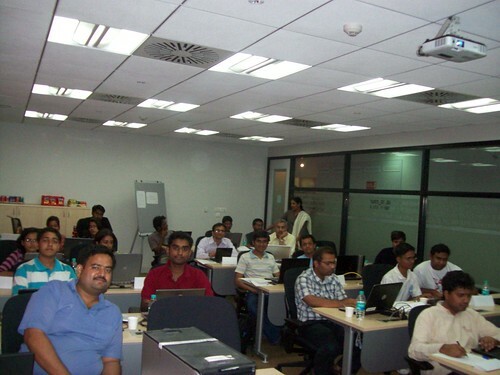 We had to restrict the number of participants because we could not handle more than 25 people effectively in our venue. But without much wider publicity – considering how I used to spam every user group list for previous events, we had all the people we needed to get going. Then we went about deciding the structure and agenda of the event. Naveen Kumar, Ankit Patel, Runa, Ani, Shanky and the rest of Red Hat’s l10n team pitched in and we were all set with content of the camp. Red Hat’s facilities team took care of all the logistics and everything went smoothly. We did not have to worry much about logistics, except for deciding the lunch menu 🙂 Mintos, Naveen, me and Runa weighed in the choices and came up with the final list. Now you know whom to blame if you did not like any curry 🙂 We had wifi setup and net connection was least of the worries. We had very interesting discussion about Free Software philosophy and business models. Most of the time people complains philosophy talks are boring. So we decided to have a question and answer format. People like me 🙂 and facilities at the office gave a definite notion that Free Software folks are not starving 🙂 So most difficult part was already taken care of. Naveen Kumar took most of the load and explained basic components of a localised application, from encoding to rendering. His fascination with numbers and deep knowledge about Unicode encoding provided a great opening and set the audience on a smooth ride ahead. 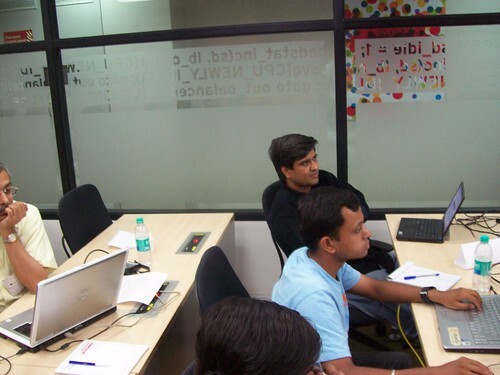 Ankit came in and introduced tools and processes in localisation. We gave participants time to get familiarised with typing in local languages and using translation tools like lokalize. Since we already decided the schedule is indicative and go deep or skip sessions based on response we were never looking at our watches (or mobiles or time applets). We had tea breaks when we felt like having a break. Karunakar kept every one in suspense when he started with his tricks for remembering inscript layout. He said he will continue the remaining parts the next day only! Runa talked about tips and tricks and we had lively discussions, some time going very deep into the root of the issue. She walked us through some of the challenging strings translators encounters every day and asked us if it was easier to teach people English 🙂 But we were not at all in a mood to give in and thought those challenges are nothing compared to expecting people to learn English. 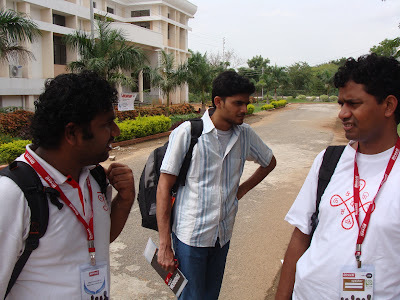 There were some interesting back and forth between me – Sankarshan, Ramakrish – Prashanth and me, Rishikesh – Prashanth. I was wondering why people don’t find computers listening in a port funny when they laugh at khidki. I think it is a deep rooted belief that is instilled in most of the society that everything foreign must be good and we should follow it (well I agree there is a logic other side also to it, every thing foreign is bad – but we should be debating and evaluating things on our own than blindly opposing or accepting anything). Rajesh Ranjan talked about FUEL project – effort to standardize frequently used words and Ramakrishna discussed cross platform database for sharing this standardisation effort widely. Rishikesh gave a social perspective and discussed how a language is related with local knowledge and culture and importance of preserving it. 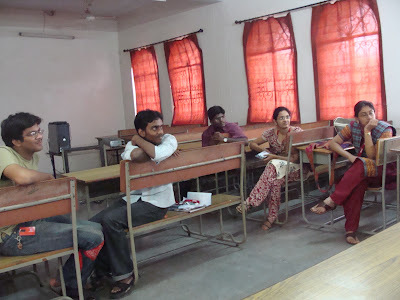 Abhijith gave different perspective about learning where people are taught to collaborate than compete. He also helped with making the press release. Sankarshan always gave helpful hints, suggestions and directions through out the planning phase. Shanky and Ani were helping out every one with translations and their systems. We are expecting feedback and summary from the students who came for the camp. Also we have updated the coordinators list with our email addresses in case any one wants to contact us for anything. We have decided to have more sessions of this kind and planned one in CoEP in May. I should say the availability of Red Hat’s l10n and i18n teams give a definite edge to Pune when compared to any other place in India. 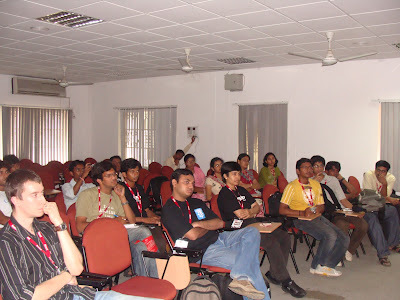 We had many people who could handle all the sessions. It was just a matter of sharing who does what. Here also we were least bothered. All in all it was a quite natural sharing of experience by many folks who believes computing should be possible in their own language. If you came for the camp and reading this post, please go back to the same wiki page and provide your feedback. There was a discussion on ilugd about how Sun can continue to provide VirtualBox non-OSE edition despite there is a GPLed version. Dual licensing and Free Software business models in general are one of my favorite topics. So I sat down and made a diagram explaining the source code flow of a dual licensed software. 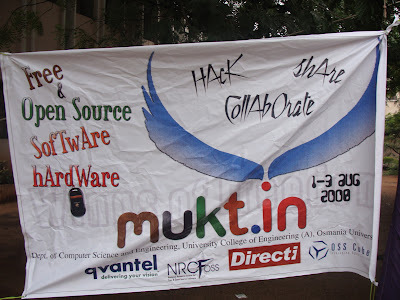 mukt.in 2008 was a great experience and I wanted to write about, but couldn’t till now. The most interesting thing about mukt.in was the level of interaction it offered. I had some very interesting discussions with many in the community and students. 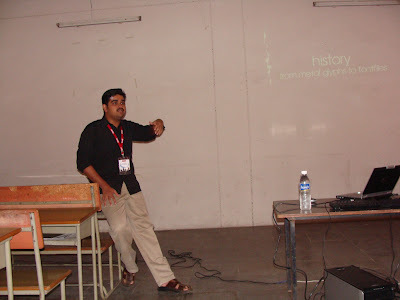 Pavithran had gathered many familiar names in the Indian Free Software community for the event. Hiran and Shyam decided to come in the last minute. 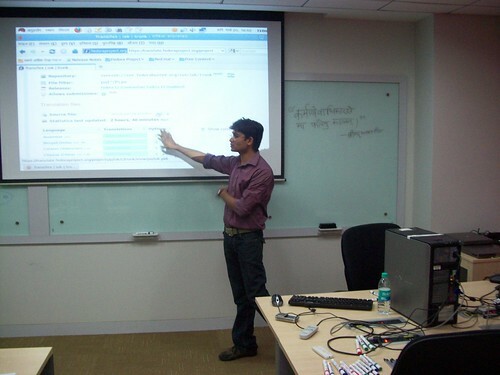 Hiran was taking a session on font designing and Shyam on speech recognition. Morning itself I met Warren of Drupal and started discussing with him about debian and ubuntu. We discussed issues relating to both the projects and was thinking of having some publicity efforts around lenny release in September. I started a thread in DebianIndia about this. Now that I won’t be in India for sometime, I hope someone would follow it up (Kartik?). Pavithran and Shreekrishna were running around making things happen. We had some discussion around localization and challenges. Some things we discussed were having consistent translations across all applications and when to transliterate (use the same words in English). Then Shaktimaan took out his Neo FreeRunner by OpenMoko project and everyone started playing with it. I got the chance to make first call on that mobile. 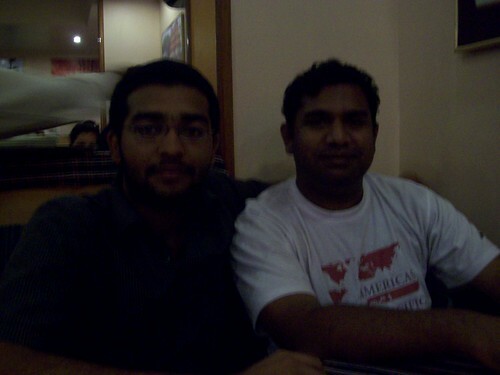 We had a plus meet at Paradise hotel with Riyaz Usman joining us for dinner. We ran in the rain, took a bus, walked on the railway platform and took and auto to reach Paradise. It was Pavithran’s brilliant idea to take a platform ticket and walk on the platform since all the roads were filled with water and would have to swim otherwise. Second day we had a very interesting BoF on Education. Thyagarajan from ilugc was telling beautiful stories about his experiences and we all shared our experiences and views on what education should provide. Some statistics here shows the progress of Malayalam translations in a week (during the most active week). Click to enlarge. Many of us were working till 3-4 am in the morning for the entire week leading upto the 4.1 deadline on July 11. #smc-project on Freenode IRC was the main connection for realtime collaboration with ‘mandoos’ (an IRC bot who can learn maanings and teach anyone who asks for it) helping the newly joined members of the team. You can join the IRC channel using your web browser by following this link. People from all over the globe and round the clock joined this effort. Some places to mention are Bengaluru, Pune, Chennai, Thiruvananthapuram, Kollam, USA … The enthusiam showed by the members throughout this great effort was amazing. In one single day 5 new contributors submited their first translation and more than 30 people contributed to this effort (Most of the contributors are listed here). It could be one of the few languages which completed kde essentials translations in such a short time. You can see the list languages sorted by their percentatge of translations here. Malayalam is currently at 63rd position, 4th among Indian languages. Here are some interesting screenshots of KDE 4.1 in Malayalam. List of contributors. Thanks to Ani Peter for making this list. After lot of confusions and uncertainties finally I am leaving to Google’s head quarters in Mountain View, California, USA for attending Summer of Code Mentor Summit 2007. I’m representing Swathanthra Malayalam Computing (SMC), the only organisation from India in the program (gnowledge project participated as part of GNU project). It is a great feeling to be representing India in this event. I am leaving this morning (5th October 2007) and will be back on Tuesday. The event is on Saturday, 6th October. The idea of this meeting of mentors from all participating projects from around the world is to share this years experience from the program and discuss ideas for next year’s summer of code. Will write more after the event. പുതിയൊരു ശബ്ദാത്മക നിവേശകരീതിയുമായി ഇത്തവണ വന്നത് ജിനേഷാണ്. ഗൂഗിള്‍ കോഡിന്റെ വേനലില്‍ സ്വതന്ത്ര മലയാളം കമ്പ്യൂട്ടിങ്ങ് പങ്കെടുക്കുന്ന 5 സംരംഭങ്ങളിലൊന്നാണിത്. ഏതാനും ദിവസങ്ങള്‍ക്ക് മുന്‍പാണ് സന്തോഷ് സ്വനലേഖ* എന്ന് പേരിട്ട തന്റെ സ്കിം നിവേശകരീതിയ്ക്കുള്ള മലയാളം ശബ്ദാത്മക പ്ലഗിനുമായി വന്നത്. സ്വതന്ത്ര മലയാളം കമ്പ്യൂട്ടിങ്ങിലേയ്ക്ക് കൂടുതല്‍ ആളുകള്‍ ആകൃഷ്ടരാകുന്നതും, സംരംഭം വളരെ സജീവമാകുന്നതും, വളരെ സന്തോഷമേകുന്ന കാര്യമാണ്. അതു പോലെത്തന്നെ സരായ് ഫെലോഷിപ്പിന് വേണ്ടിയും സ്വതന്ത്ര മലയാളം കമ്പ്യൂട്ടിങ്ങ് വഴികാട്ടുന്ന സംരംഭങ്ങള്‍ക്കപേക്ഷിച്ചിട്ടുണ്ട്.